Works have completed on the new mixed use retail and leisure development on Regent Street, Mabgate, extending the retail-leisure led rejuvenation of this key area and prime gateway to Leeds city centre. Formerly a Reg Vardy Renault dealership, the 2.5-acre site is now home to a 16,500 sq. ft Aldi store and 18,500 sq. ft Pure Gym fitness facility designed by The Harris Partnership for Gregory Property Group, with a further 7,500 Sq. 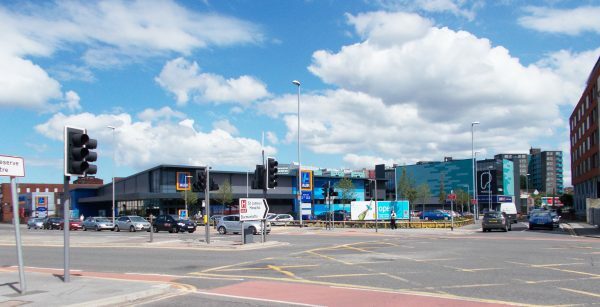 ft of retail space provided for Poundworld. Mabgate Junction is located on the approach to the new Victoria Gate centre at the North Eastern edge of Leeds city centre. Operator handover to fit out commenced in January with retailers scheduled to open from June 2017 bringing new jobs to the local community.